Being a huge fan of food trucks and knowing their general whereabouts during the week, I'm ashamed to say I had never heard of Two for the Road before going to the IE Food Truck Festival. 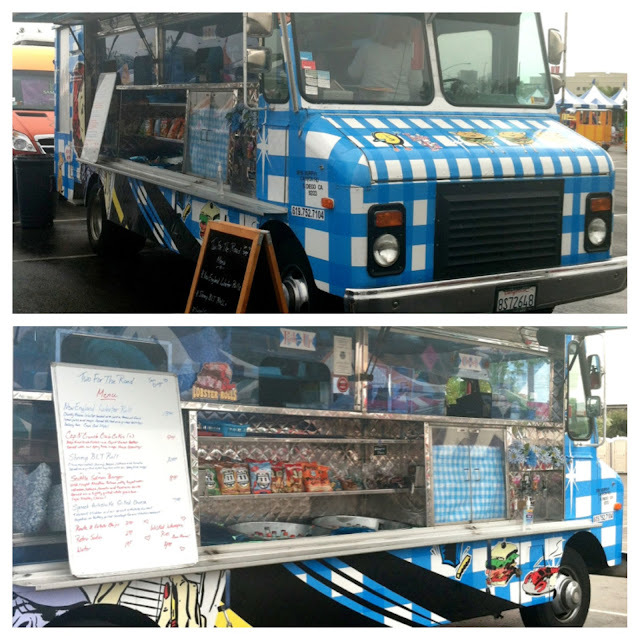 Their blue picnic table-esque painted truck easily catches the eye and forces you to at least scan their menu. Their drinks and chips are all retro to go with the theme of their 50's style comfort food. When I saw that they were specializing in seafood that day, I knew I had to read the whole list of specials to see if their creativity would lure me to eat there. 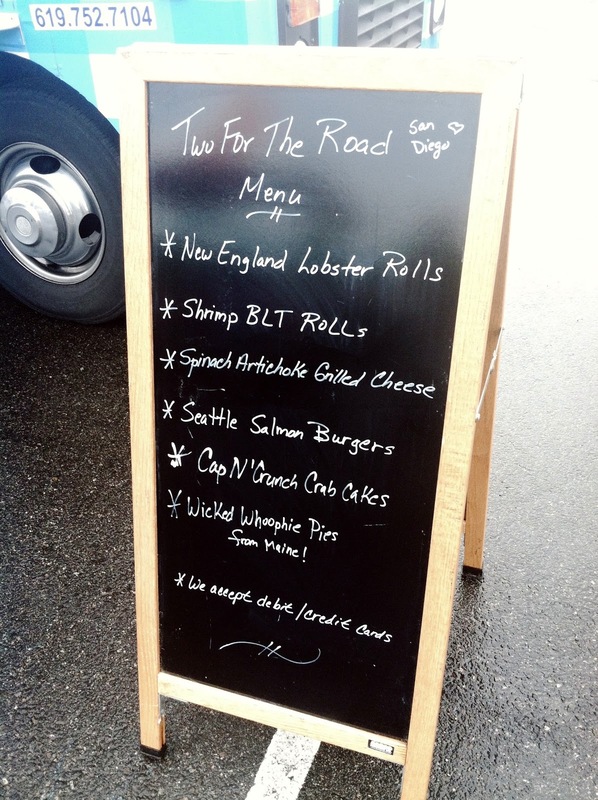 I had to bypass the Lobster rolls, the shrimp BLT and salmon burgers and although it sounded delicious, I had seen it all before. And that's when I saw it, Cap'N Crunch crab cakes. I think I stood there for a good minute just staring at those words. I love captain crunch, I love crab and I definitely love things that have the word cake in it. 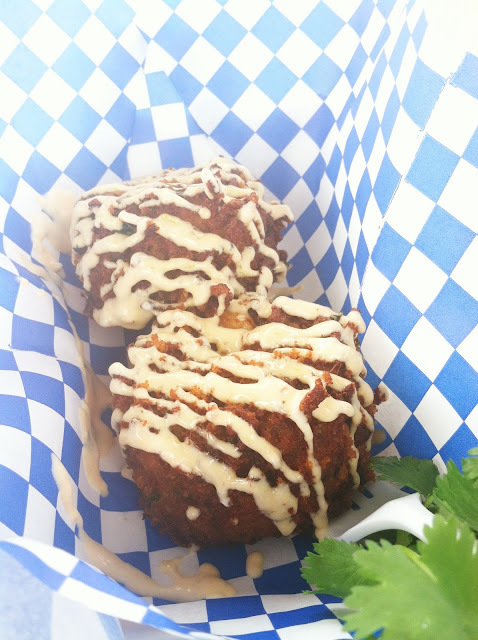 I promptly ordered my $9.00 crab cakes, which at the time seemed expensive buy they are hefty in size and weight. I didn't have to wait long before these beautiful fried cakes were in my hands, slathered in a creamy sauce and ready to be devoured. The first bite was pure crunch and my main intent was to find the captain crunch taste and see if it enhanced the flavor of the crab. I'm sad to saw the cereal burst of flavor I was looking for underwhelmed and wasn't a crazy spectacular party in my mouth like I thought it would be. HOWEVER, the batter was still extremely delicious by being buttery, slightly salty, and the perfect texture to contrast the soft filling. The chunks of crab were fresh and very distinct throughout the cake, I pretty much knew I had paid for quality and that's always a great feeling. Along with the crab, the filling had onion and probably a mayonnaise mixture to hold it together. I just knew it was fluffy, rich and fattening in the I-really-don't-regret-this kind of way. Let's not forget the wonderful sauce that was drizzled so beautifully on top of these crispy crab creations that gave the perfect level of tangy to the soft flavors of the cake. I would honestly go back to this truck, especially to try their lobster roll and compare it to the Lobsta truck's. Also, I can't guarantee they would have the crab cakes during any given time because on their website they stated that their menu changes regularly. But if the rest of their food is anything like what I ate, then I wouldn't hesitate to try everything else at least once.